After having completed the conversion at Linz to the fullest satisfaction we received the order for the conversion of Cineplexx Salzburg. The time as well as the reconstruction during ongoing operation has proven to be challenge in Salzburg as well. The Austrian based company Cineplexx is once again living up to its reputation as a pioneer in the field of cinematic technology as proven by installing a 3D laser projector – namely Dolby Cinema- in its establishment in Salzburg. The Dolby Cinema at the Salzburg Airport Cinema will be the second one of its kind in the DACH are with the Guarantee for a revolutionary new and extraordinary cinema experience. ‘Dolby Cinema employs the most spectacular technology cinema has to offer. Our visitors in Salzburg can look forward to breathtakingly clear images and a unique sound, ‘Christian Langhammer, Managing Partner of Cineplexx stated about the project. The conversion and modernization started on April 18, 2016 and is taking place during ongoing operation. The opening of the new project is scheduled for mid-July. Cineplexx invests about five million euros for the modernization of its Salzburg Airport Cinema. The cinema is going to have a completely new layout: every auditorium is going to be modernized, the entrance area of the building has been remodelled and the interior has been redesigned with stylish design elements and a lounge area. The renovation will also include the cash register, the kiosks and all sanitary facilities. “We are transforming Cineplexx Salzburg Airport to a cinema of the European top class and combine state-of-the-art cinema-technology with a modern appearance,” says Langhammer. Dolby Cinema: The most innovative image- and sound-technology combined with exceptional design Cinema allows film lovers to enjoy a unique cinema experience in the Dolby Theatre. The combination of DolbyVision’s dual laser projection, state-of-art image reproduction technology, and the life-like Dolby Atmos sound lets audiences immerse themselves into the action of the film therefore guaranteeing a captivating cinema experience. 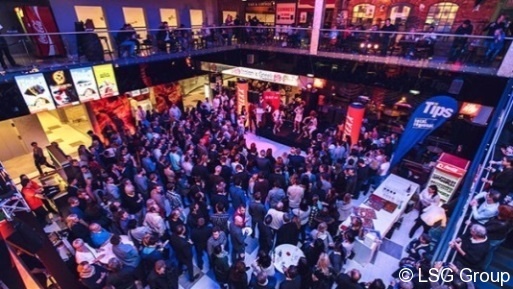 The creation of a film atmosphere will start in the entrancehall. The so-called “Prelude” is a modern entrance area which is decorated with picture projections and offers a first view into the movie in question. Once arrived in the hall, The visitors will observe a black covering, in the shape of a cocoon which envelops the entire hall. 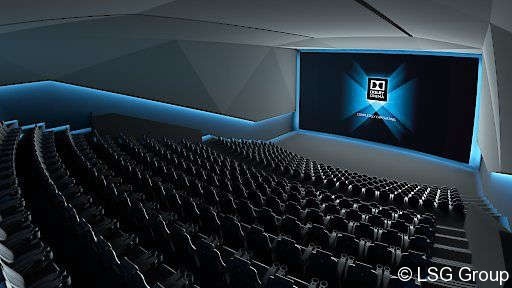 The Dolby Cinema Hall, including the cinema chairs and floor, is kept in black. This not only directs the attention of the visitors to the pictures on the wall but also optimizes the colour contrasts. Our assignment will also cover all electrical engineering.